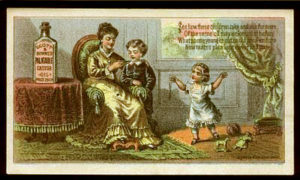 In the 19th century, castor oil was a common remedy in American homes (see old advertisement, right), but its use has fallen out of favor, perhaps in part because people have become aware of the notorious killer, ricin (which comes from castor seeds but is not present in the pressed oil). The FDA has categorized the oil as “generally recognized as safe and effective” (GRASE) for over-the-counter use as a laxative (4). Mercola (1) suggests we all should keep a bottle of castor oil at home (1). Most uses of this oil are topical (on skin and hair), but it is also used internally to treat constipation. It is advisable to keep it out of reach of small children.